Gold Rush Resort Rentals Blog: Easter Greetings! "Hoppy" Easter from our team at Gold Rush to all our family, friends, and guests! While all of you are busy at home waking up to the surprise that the Easter bunny left for you, don't forget that Snow Summit is having their annual Easter Egg hunt at 10am today for children 12 and under. There's no charge for this fun event. We'd love for you to share any photos from the event. If you'd like to please post them here or send them to goldrushreservations@gmail.com and we will post them for you. Here's a photo or our creative handywork on the tree in our office. We love bringing out each holiday with festive decor to welcome all of our guests who may be coming during each holiday season. 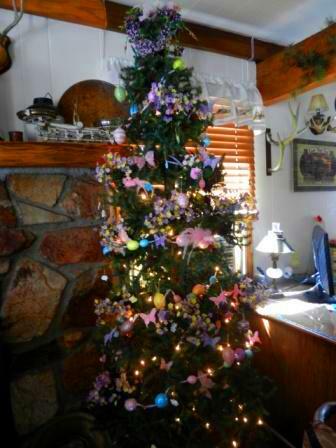 For those of you who have not been able to come into our office, here's the photo of our Easter Egg tree.